Winter has finally made its way to Phoenix. Chilly weather is upon us. This makes it the perfect time of year for the type of food that sticks on your bones. 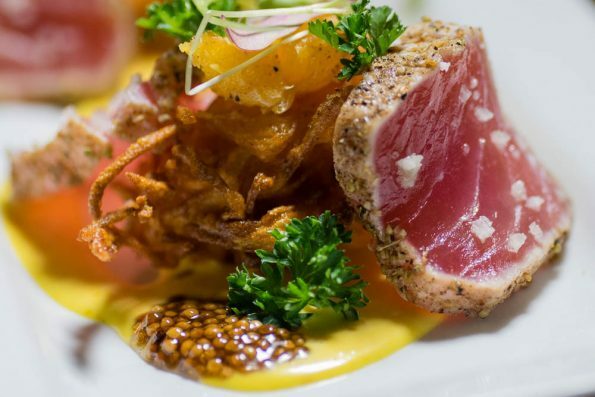 The new winter menu at the Blue Hound Kitchen in Phoenix does just that. Their new items are elevated comfort classics that promise to warm you right up. The Monroe (Dickel Rye, Silencio Black, Lillet Blanc, velvet falernum, bitters, black pepper). 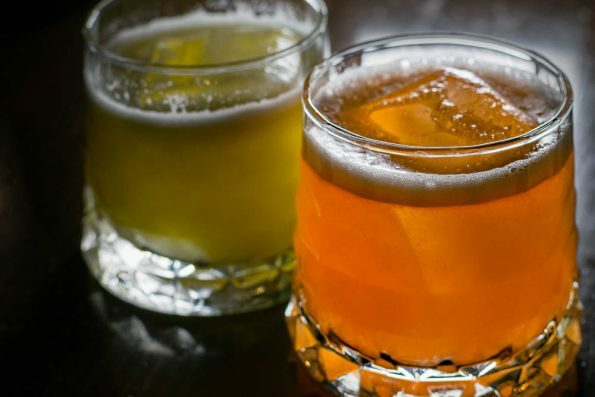 These cocktails are definitely the type of cocktail geared towards seasoned craft cocktail enthusiasts (delicious as well). 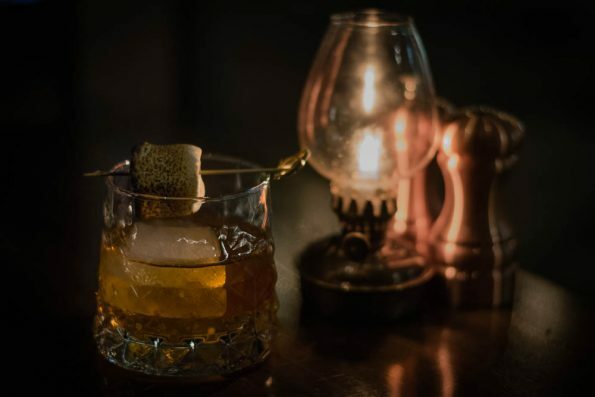 However, the Lost Boy Scout lends itself to someone who might just be starting to enjoy whiskies, as it had a sweeter (but very well balanced) flavor. Skinny Dipper (Silencio Black Mezcal, Aperol, Liquor Strega, lime, egg white, simple, Peyschaud Bitters). Both were completely different from our earlier drinks, but none the less still complex and full of delicious flavors. The use of avocado puree in The Replacement was unique and interesting. The Skinny Dipper had the perfect use of mezcal but was not overly smokey. Albacore tuna (root vegetable cake, charred citrus, pickled mustard seed, aji amarillo)- The tuna was such a great appetizer in that is played with your senses. Not only was it visually appealing and tasted fantastic, but it’s use of texture was outstanding. The crispiness of the root vegetable cake paired with the softness of the tuna and citrus was great. Clams (garlic, shallots, ginger beer, Noble Bread)- This was our favorite of all the appetizers and was a very close 2nd for our favorite item of the evening. The broth the clams were cooked in was loaded full of delicious flavor (who’d have thought ginger beer would be good with clams?). 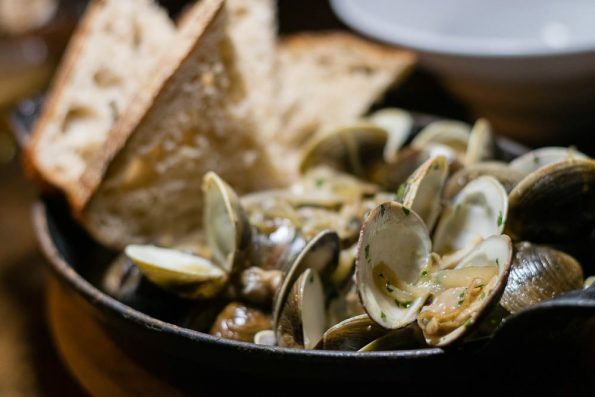 We found ourselves talking about the clams most of the evening and couldn’t stop dipping our Noble Bread in the broth. We also may or may not have also been fighting over the shallots. 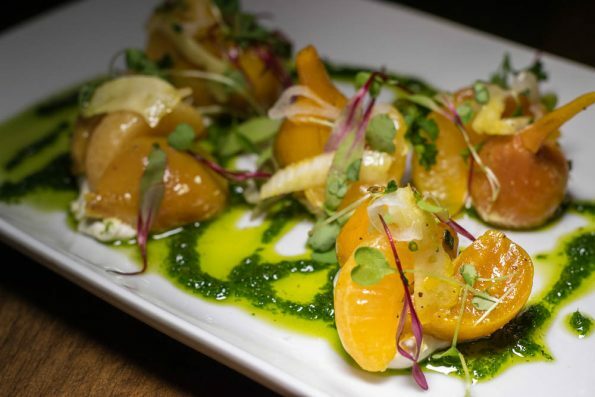 Roasted Beets (boursin, clementine, fennel, pickled shallots, garden vinaigrette)- Anytime you can get us to eat beets and actually enjoy them, you’re ahead of the game, and we did enjoy them! The use of the boursin, pickled shallots, and vinaigrette really help to take that earthy flavor away from the beets. Some people enjoy that factor of the beet but for us, it needs to masked at all costs. 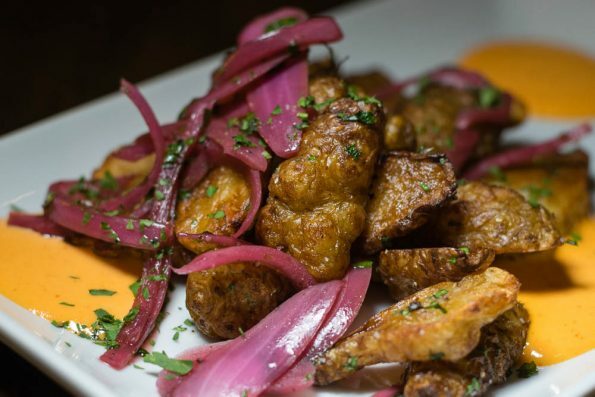 Sunchokes (pickled onions, chili aioli)- Sunchokes were totally a new thing for us. We really like them though. Sunchokes are sort of a cross between a potato and a parsnip flavor wise. These particular sunchokes were flash fried and baked so their texture was like that of steak fries. The pickled onions served with them really added some great flavor. Handmade Pasta (pumpkin seed pesto, marsala wine, butternut, mushrooms, sage)- This was probably our favorite item of the evening. Everything about it just screams perfection. The pumpkin pesto was unexpected and delightful. The mushrooms soaked up all of the delicious flavors, and the butternut squash gave it that little extra touch to take it over the top. 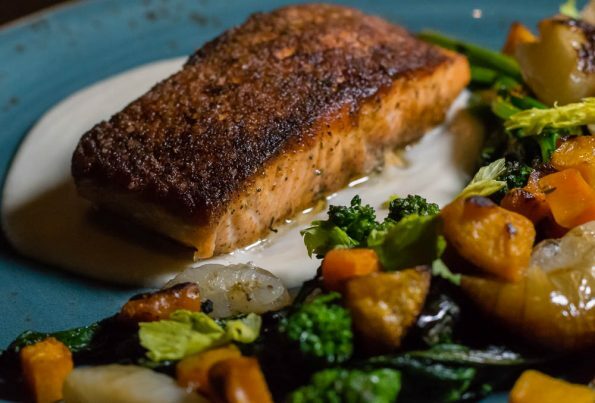 Blackened Salmon (celery root puree, rapini, cipollini)- Salmon is one of those items we just never seem to order. We love salmon, but it always seems like there is something we want to try more. This salmon is definitely worth ordering. Cooked and seasoned to perfection, it is a must not miss. The celery root puree was a unique addition which made us want to try our own variation at home. Both entrees were light but at at the same time, stuck with you. Each personify what you would want from comfort food without being so much that you can’t move afterwards. 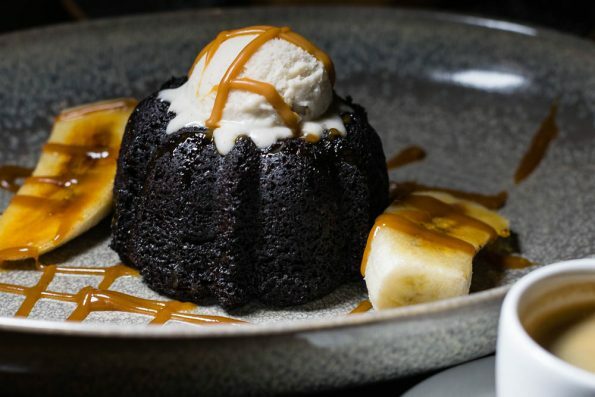 Chocolate Cake (Peanut butter caramel, banana ice cream, bruleed bananas)- This cake is a chocolate lovers dream! Warm and fluffy, but not too sweet. The peanut butter caramel is more like a roasted peanut caramel but is absolutely fantastic! We also really enjoyed the depth of flavor the bruleed bananas added. 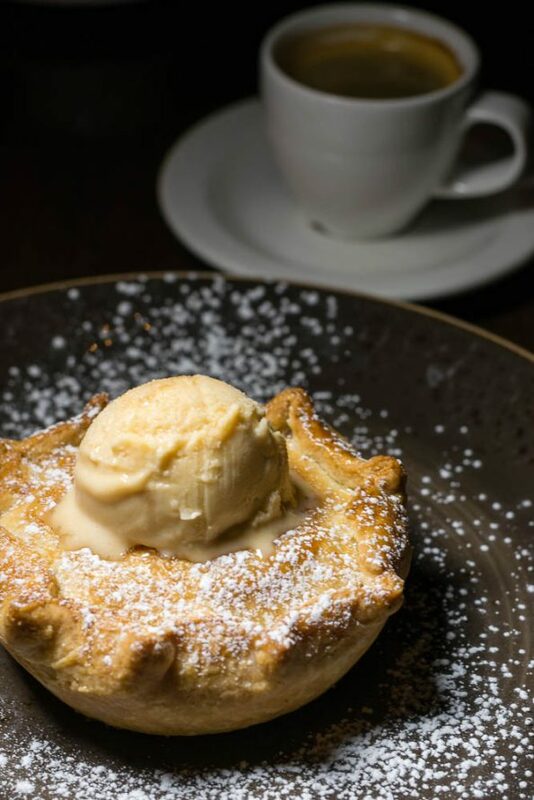 Blue Hound Apple Pie (Salted caramel ice cream)- This apple pie is the true definition of comfort food. The crust had that perfect buttery flavor and flaky texture. The apples were warm but not mushy. The ice cream completed the traditional ala mode feeling but in all honesty, the pie was good on it’s own too. We really enjoyed kicking off our winter dining with The Blue Hound Kitchen. There is never a bad meal here and their cocktails are always spot on. 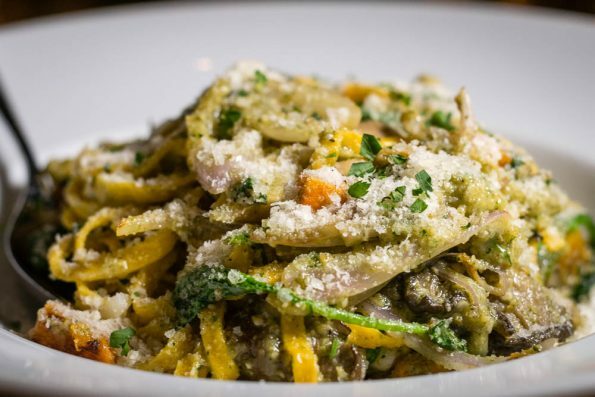 We look forward to heading back and eating more of those clams and that delicious pasta! What is your go-to comfort food? Leave your comments below or use the hash tag #GeekEats. Stay warm!